Record Webcam Videos For YouTube, MySpace etc. with Super Webcam Recorder. ...... For WMV, you can choose from a list of pre-defined profiles, targeted at different usages. Super Webcam Recorder Record works fine with All USB and Parallel web camera, Like usb webcam, notebook webcam. bluetooth webcam, digital webcam, digital camera, wireless webcam. 1. Record video clips quickly and easily. 2. You can choose the video compressor, You can encode video to use Codec: MP4, DIVX, XVID, Windows Media Video, Microsoft MPEG-4 Video Codec V2, etc. 3. You can choose the audio compressor, Encode audio to use Codec, Like MPEG Layer-3, LAME Audio Encoder, Messenger Audio, Windows Media Audio V2 Codec etc. 4. Select audio input from your sound card such as microphone, stereo wave mix, wave out, etc. 5. Take still image snapshots to JPG or BMP file. Qweas is providing links to Super Webcam Recorder 4.2 as a courtesy, and makes no representations regarding Super Webcam Recorder or any other applications or any information related thereto. Any questions, complaints or claims regarding this application Super Webcam Recorder 4.2 must be directed to the appropriate software vendor. 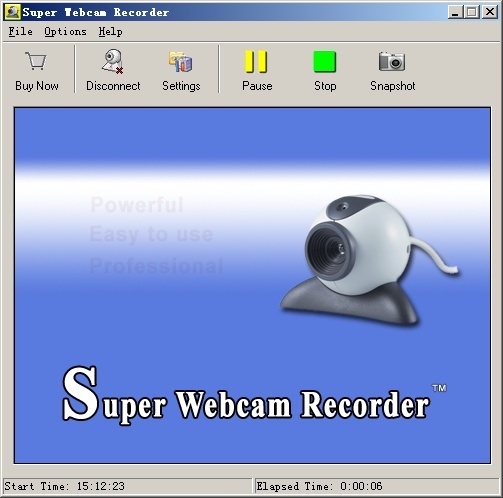 You may click the publisher link of Super Webcam Recorder on the top of this page to get more details about the vendor.